So because Windows 7 is still in Beta, Veeam FastSCP 3.0 does not support it, but it does not mean that you cannot use it. 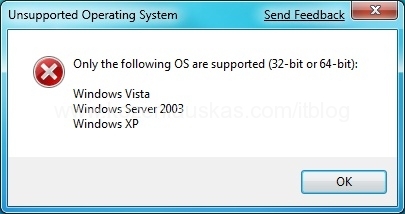 While trying to install the application on Windows 7 beta you’ll get the following message. To get around it you can use Winrar to extract the package and launch FastSCPSetup.msi file. If you don’t have Winrar and don’t want to install it use command line to extract the content of veeam_fastscp_3.0.exe. You can get your copy from here.